The combination of data streams and services created by digitizing everything creates four basic usage models — Manage, Monetize, Operate and Extend. These four basic models can be applied to any of the four “Internets.” Enterprises should not limit themselves to thinking that only the Internet of Things (IoT) (assets and machines) has the potential to leverage these four models. For example, the pay-per-use model can be applied to assets (such as industrial equipment), services (such as pay-as-you-drive insurance), people (such as movers), places (such as parking spots) and systems (such as cloud services). Enterprises from all industries can leverage these four models. Worldwide shipments of 3D printers are expected to grow 98 percent in 2015, followed by a doubling of unit shipments in 2016. 3D printing will reach a tipping point over the next three years as the market for relatively low-cost 3D printing devices continues to grow rapidly and industrial use expands significantly. New industrial, biomedical and consumer applications will continue to demonstrate that 3D printing is a real, viable and cost-effective means to reduce costs through improved designs, streamlined prototyping and short-run manufacturing. Analytics will take center stage as the volume of data generated by embedded systems increases and vast pools of structured and unstructured data inside and outside the enterprise are analyzed. “Every app now needs to be an analytic app,” said Mr. Cearley. “Organizations need to manage how best to filter the huge amounts of data coming from the IoT, social media and wearable devices, and then deliver exactly the right information to the right person, at the right time. Analytics will become deeply, but invisibly embedded everywhere.” Big data remains an important enabler for this trend but the focus needs to shift to thinking about big questions and big answers first and big data second — the value is in the answers, not the data. Ubiquitous embedded intelligence combined with pervasive analytics will drive the development of systems that are alert to their surroundings and able to respond appropriately. Context-aware security is an early application of this new capability, but others will emerge. By understanding the context of a user request, applications can not only adjust their security response but also adjust how information is delivered to the user, greatly simplifying an increasingly complex computing world. Deep analytics applied to an understanding of context provide the preconditions for a world of smart machines. This foundation combines with advanced algorithms that allow systems to understand their environment, learn for themselves, and act autonomously. Prototype autonomous vehicles, advanced robots, virtual personal assistants and smart advisors already exist and will evolve rapidly, ushering in a new age of machine helpers. The smart machine era will be the most disruptive in the history of IT. In the near term, the focus for cloud/client will be on synchronizing content and application state across multiple devices and addressing application portability across devices. Over time, applications will evolve to support simultaneous use of multiple devices. The second-screen phenomenon today focuses on coordinating television viewing with use of a mobile device. In the future, games and enterprise applications alike will use multiple screens and exploit wearables and other devices to deliver an enhanced experience. Agile programming of everything from applications to basic infrastructure is essential to enable organizations to deliver the flexibility required to make the digital business work. 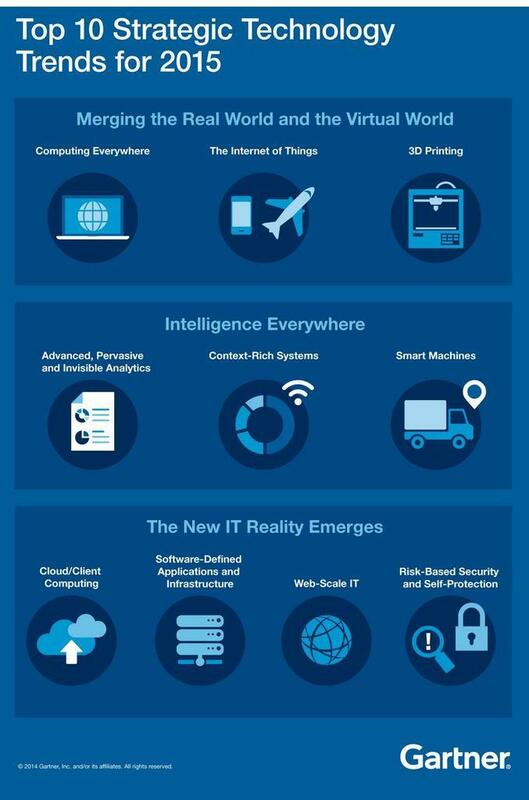 Software-defined networking, storage, data centers and security are maturing. Cloud services are software-configurable through API calls, and applications, too, increasingly have rich APIs to access their function and content programmatically. To deal with the rapidly changing demands of digital business and scale systems up — or down — rapidly, computing has to move away from static to dynamic models. Rules, models and code that can dynamically assemble and configure all of the elements needed from the network through the application are needed. Web-scale IT is a pattern of global-class computing that delivers the capabilities of large cloud service providers within an enterprise IT setting. More organizations will begin thinking, acting and building applications and infrastructure like Web giants such as Amazon, Google and Facebook. Web-scale IT does not happen immediately, but will evolve over time as commercial hardware platforms embrace the new models and cloud-optimized and software-defined approaches reach mainstream. The first step toward the Web-scale IT future for many organizations should be DevOps — bringing development and operations together in a coordinated way to drive rapid, continuous incremental development of applications and services. All roads to the digital future lead through security. However, in a digital business world, security cannot be a roadblock that stops all progress. Organizations will increasingly recognize that it is not possible to provide a 100 percent secured environment. Once organizations acknowledge that, they can begin to apply more-sophisticated risk assessment and mitigation tools. On the technical side, recognition that perimeter defense is inadequate and applications need to take a more active role in security gives rise to a new multifaceted approach. Security-aware application design, dynamic and static application security testing, and runtime application self-protection combined with active context-aware and adaptive access controls are all needed in today’s dangerous digital world. This will lead to new models of building security directly into applications. Perimeters and firewalls are no longer enough; every app needs to be self-aware and self-protecting.